The campers have gone, and we are packing away the tents in their winter storage place. This time of year the campsite turns into a bit of a building site – as we begin campsite renovations to improve things for the coming year – but even more so in the past two years because of our exciting construction project. 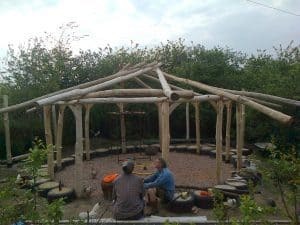 For those who don’t know, we are in the process of completing a roundhouse which we started nearly 3 years ago. The house was entirely designed by us, and is constructed from a timber frame with walls made from cob, cordwood and straw bales. Every stage of the build has been a learning curve for us – not having done anything like this before – hence the time it has taken to get this far. Running two businesses whilst building a house is definitely a challenge! This time of year, however, we can really get stuck in. A bit about the construction process. First we dug a foundation, and then we built the timber frame from locally sourced sweet chestnut. The roof is a self-supporting reciprocal roof & once the timbers were in place we added locally cut and milled larch boards over the chestnut. We built our stem wall from local recycled tyres, filled with rammed earth. A layer of reclaimed insulation board was placed on the roof, before a large pond liner was added to cover the whole structure. This is the waterproofing layer, above which we added sedum – a succulent plant which creates a wonderful green roof. 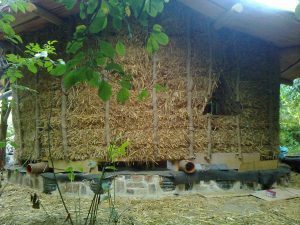 Once the roof was watertight we were able to start building the cob walls – which are 50cm thick. 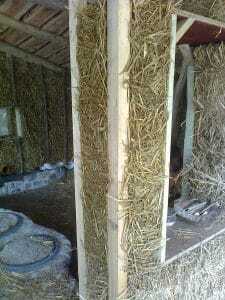 Cob is a mix of sand, clay, straw & water, which we have mixed by laying all the ingredients on a tarp and treading it in. It is a very time consuming but fun process. 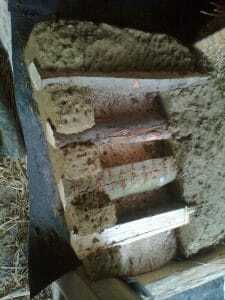 In the middle of the cob wall we have left a cavity which we filled with sawdust to form an insulation layer. 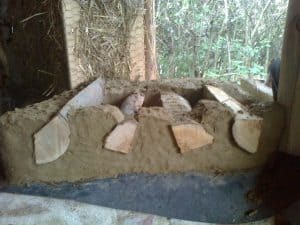 Cordwood was laid into the walls to tie them together and add insulation as well as beauty. Light tunnels were made from bottles and jars to add light and decoration to the walls. On the south side of the house we added large windows and big glass doors – all of which are double glazed. This glass, as well as the slightly raised roof over the doors, allows the winter sun to penetrate the house and warm the space using passive solar. The floor is cob with insulation underneath, and forms a massive heat store which then radiates heat into the house in the evening. The overhang of the walls, and the cleverly designed cupola, prevent the high summer sun from overheating the house and it remains beautifully cool in the hot weather. The north walls are made from straw bales – to give this side of the building the best insulation possible. These bales have been plastered with several layers of thick cob plaster. We have tried to combine as many techniques as possible – to maximise the learning experience. 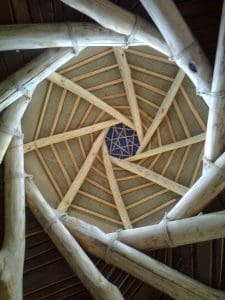 Amongst these techniques are: cob, cordwood, light clay straw, stud walls from pallets, roundwood timber framing, cob floor, rammed earth tyres, earth plaster, limewash, handmade shingles, rendering, passive solar design, wood-fired heating & recycling. 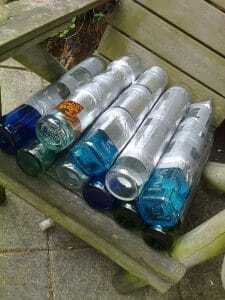 We have sourced all the materials we can locally. The sand is from a nearby quarry (and some was from our car park when we had some work done! ), the clay from a friend’s yard in the next village, nearly all the timbers were grown in Suffolk, the sawdust a waste material from a local carpenter, tyres recycled from a few miles away, straw locally grown. When finished, the house will have a polished cob floor, a rustic 4-poster bed and a separate sleeping extension. It will also have a kitchen area and shower room. The house will be ready to rent alongside our other accommodation sometime in 2019.